Claude Monet (1840–1926), The Tuileries (1876), oil on canvas, 54 x 73 cm, Musée Marmottan-Monet, Paris. Wikimedia Commons. Not available for Kindle or in the iTunes Store. Claude Monet became the best-known Impressionist during the latter part of the twentieth century, and mere mention of his name is normally sufficient to draw crowds, inflate auction prices, and sell books. Ralph Skea has already written an excellent introduction to Vincent van Gogh’s paintings of trees, and here affords the same to Monet. Not that Monet would have come to the front of my mind for his depictions of trees, but he was prolific enough at landscapes to have painted ample trees in his time. Skea’s short introduction takes a traditional approach to Monet, in accepting that he was committed to accurately rendering transient and subtle effects of light and environment, and to recording his personal sensations in response to what was around him. The first chapter follows with a good biographic summary, which goes out of its way to credit Boudin and Jongkind for their important contributions. 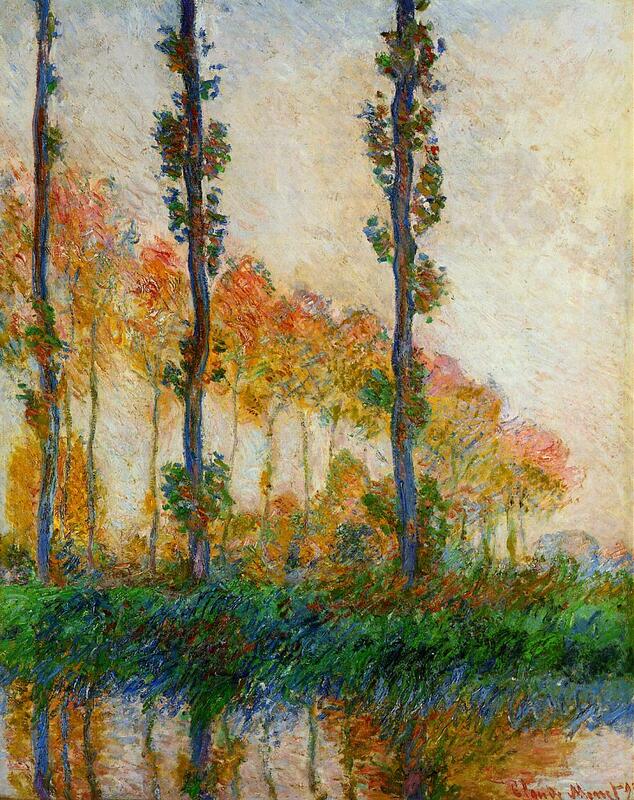 This leads on to an explanation of the role of trees and gardens in Monet’s works. Accompanying illustrations start well, with a good selection from Monet’s early work, including The Bodmer Oak (1865). However Skea does not maintain chronological order later, nor does he explain the changes in style which are seen in Monet’s paintings after 1865. Throughout the book captions give the recognised English title and year of each painting, and a short explanatory section which links each into the chapter. Fuller details, including dimensions and location, are given at the back in the Picture Credits. 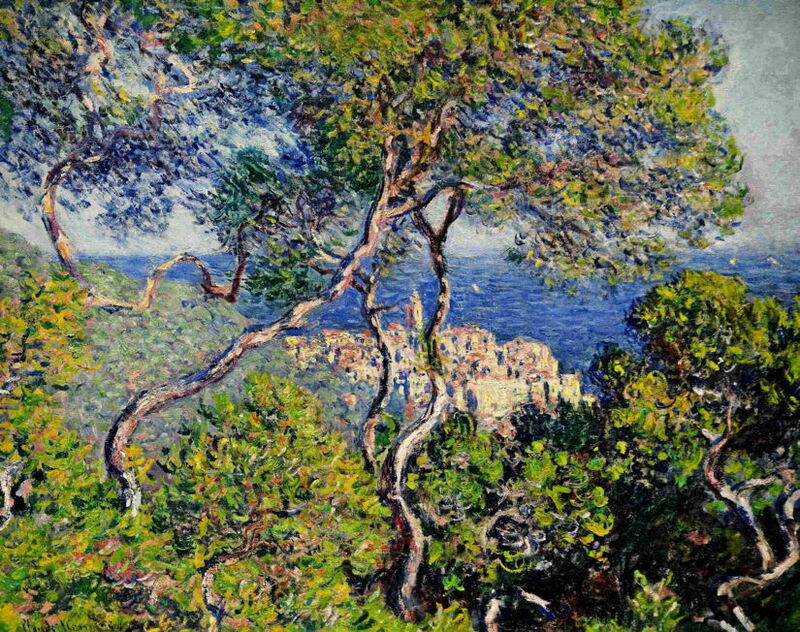 Claude Monet, Bordighera (1884), oil on canvas, 65 x 80.8 cm, The Art Institute of Chicago (WikiArt). Skea establishes a particular interest in Monet’s waterside trees, which he develops in the second chapter. Here there is coverage of his many paintings of different sections of the Seine, a brief account of his series including the poplars near Giverny, and good examples of his work from the Mediterranean coast. Claude Monet, Peupliers au bord de l’Epte, automne (1891) W1297, oil on canvas, 100 x 65 cm, Museum of Fine Arts, Boston. WikiArt. The third chapter returns to woods, and a different version of The Bodmer Oak (1865). Skea then perhaps starts to stretch his subject a little, with a selection of Monet’s paintings of fields with trees, before getting back on track with trees in blossom. These form a convenient link to the fourth chapter, in which there is a range of Monet’s paintings of parks and gardens. Here Skea also covers the later paintings of water lilies at Giverny, and starts to become slightly tenuous again. Claude Monet, Les Trois Arbres, automne (1891) W1308, oil on canvas, 92 x 73 cm, Private collection. WikiArt. The final chapter appropriately considers Monet’s paintings of trees in winter landscapes, ending with a puzzlingly-placed illustration of Olive Trees in the Moreno Garden (1884), which was perhaps better identified as an envoi for the book as a whole. End-matter includes references for the quotations from Monet and van Gogh used throughout the book, a good little list for further reading, and the picture credits with additional information. This is an excellent and thoroughly enjoyable account of important aspects of Monet’s work. Although some of the paintings chosen for illustration digress perhaps a little too far beyond its title, they provide good and broad coverage. This brief book would make a lovely present for someone who likes Impressionist landscapes, or who is interested in the depiction of trees in painting. 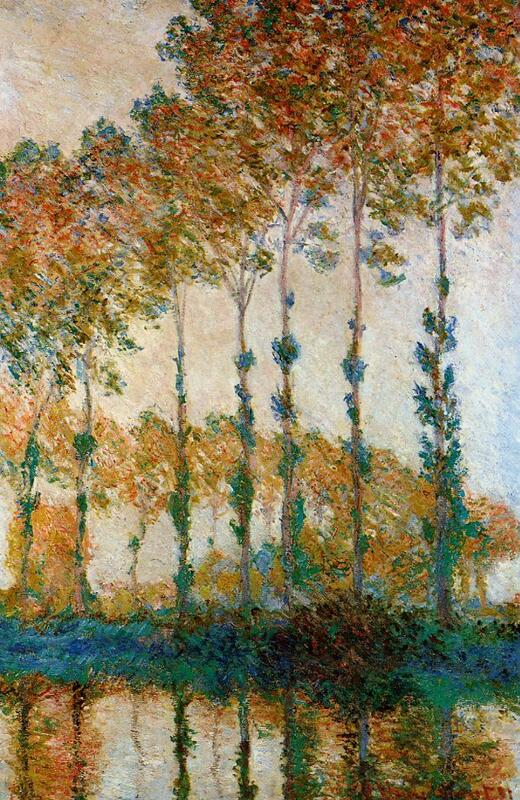 Posted in General, Painting and tagged Impressionism, Monet, painting, trees. Bookmark the permalink.